If you live in an area with pine trees, you probably have an abundance of pine cones at your fingertips. At first thought you might be annoyed by this, but the truth is pine cones can actually be quite beneficial! So don’t toss those pine cones out just yet. Check out these 6 Ways to Use Pine Cones in Your Garden, and see how awesome having these little guys around can be! Pine cones may mainly fall during the fall season, but that doesn’t mean you can’t find them (and use them) earlier in the year! If you haven’t gathered up all the pinecones in your yard, you probably have plenty still available. And even if you don’t have any around your home, local parks and walking paths are likely to still have plenty under the trees. While I love to use pine cones in crafts, what’s great about using them in your garden is you don’t have to clean them before you use them, since they’ll be staying outside! As pine cones break down, they release nutrients that can be beneficial to your plants. As you collect pine cones, you can always add them to your compost bin. This way when they break down, they will release all of those nutrients into the mixture and help create power packed food! Of course, pine cones are pretty dense, so it’ll take them a while to break down on their own. To speed them up, break them up before putting them in your compost. You can run over them with your lawn mower, or smash them with a shovel first. 2. Use them as mulch. Smaller pine cones can be placed in bulk around trees and plants in order to act as mulch. They will do a great job at keeping the plant roots protected while helping hold in moisture. They work just as well as store-bought mulch, but the nice thing is you can get your hands on them for free! But do be aware- pine cones are very flammable because they contain pine resin. So don’t use them as mulch near the area where your grill or fire pit is, for example. You wouldn’t want any loose sparks landing in them and starting a fire! 3. Add them as decorative borders. A fun way to use pine cones in your garden is as decoration! Pine cones have a lovely aesthetic to them. Try placing pine cones inside of flower pots and planting boxes as a decorative touch. You can line them up like natural borders, or just use them as natural ground cover. While being used for decorative purposes, they will still help keep soil moist and protected. 4. Provide a home for ladybugs. Ladybugs are always in search of little crawl spaces. Keep a few pine cones under tall and shady plants so the bugs can find refuge in them. Ladybugs also eat pests like aphids, so it’s a great idea to make them feel welcome in your garden. So go ahead and set out some pine cones out for them. They will no doubt appreciate the hospitality! Want to take this idea one step further? David Domoney has a great article on how to make a ladybug hotel out of pine cones! 5. Make a bird feeder. Make birds feel welcome in your garden when you craft your own pine cone bird feeder! Simply spread peanut butter on the pine cone and roll it in bird seed. Allow the seed to dry in place, then add some string for hanging. Birds will love pecking away at this nutritious treat, and you will love how cheap these are to craft. 6. Use them as container fillers. Do you have a large planter to fill? Filling it entirely with dirt can make it heavy and expensive. Instead, fill it halfway full with pine cones. This will not only help improve drainage of the pot, but will fill in a lot of space so you don’t have to use as much dirt. This saves you time, money, and can even help your plant drain and absorb nutrients better. 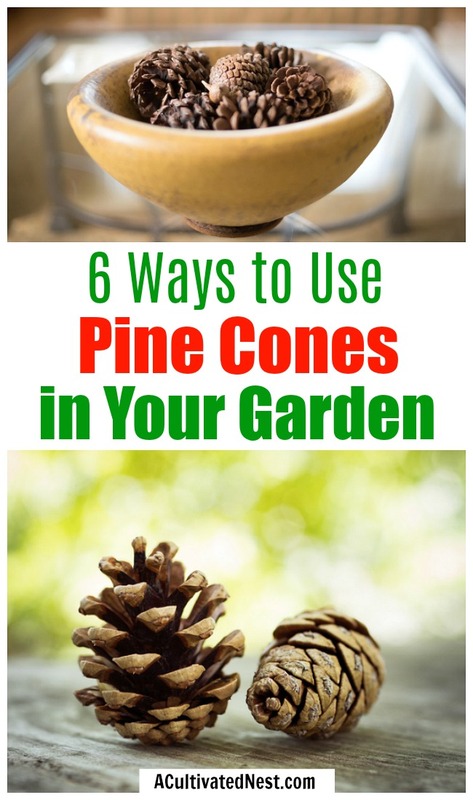 As you can see, there are all sorts of ways to use pine cones in your garden. 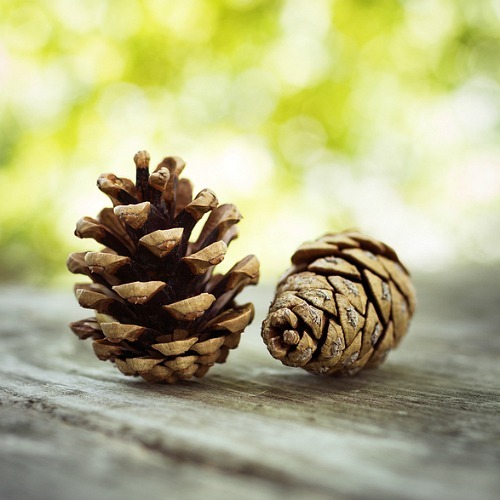 Whether you want to enrich the soil, protect your plants, or just provide some hospitality for bugs and birds, all of these ideas are easy ways to put those pine cones to use. So start saving pine cones as you see them! A simple collection basket is perfect for doing exactly this. 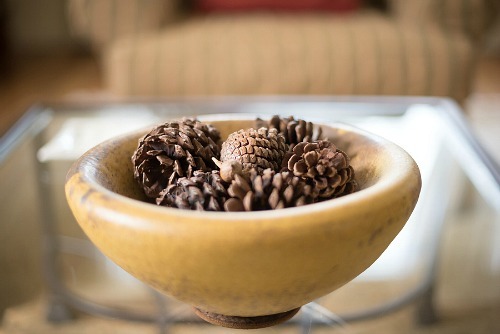 When storing pine cones, just keep them in a cool and dry place out of your main living area, like a garage or shed. They should be fine until you are ready to use them. All types of pine cones will do. It doesn’t matter what type of tree they fell from, as they will all do the same job. Are you ready to get started? Head to the yard and start hunting those pine cones now! Do you have any fun ways that you use pine cones, either as indoor DIYs or garden projects?